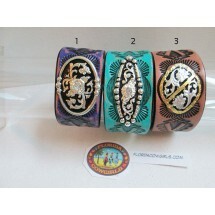 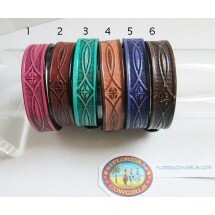 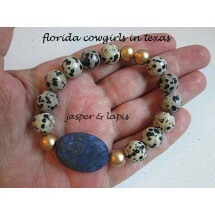 Handcrafted cowgirl necklace jewelry since 2008 by a Florida Cowgirl now living in Texas. 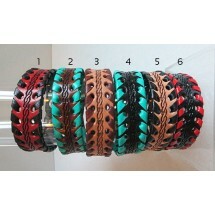 Most pieces are one of a kind and unique. 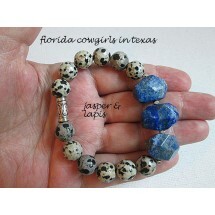 Stretch bracelet, roll on-roll off, dalmation jasper with chunky lapis nugget beads and silver metal.. 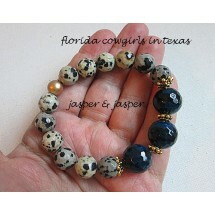 Stretch bracelet, roll on-roll off, dalmation jasper with a matte lapis focal bead and gold wood acc.. 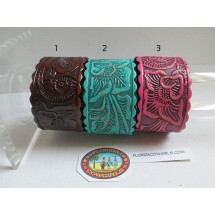 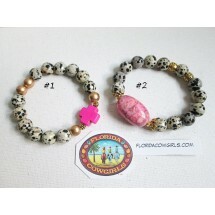 Stretch bracelet, roll on-roll off, fits up to 7.5 inches Choose #1 Dalmation jasper with a pink .. 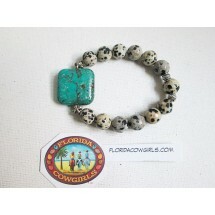 Stretch bracelet, roll on-roll off, dalmation jasper with a large square chinese turquoise focal bea.. 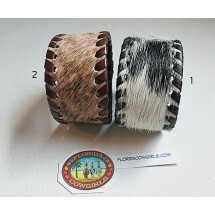 Stretch bracelet, roll on-roll off, dalmation jasper with dark blue faceted round jasper beads ..
Carved Leather Cuff with Concho Tapered from 1 1/4" to 3/4", has a snap closure, carved design, w..
Leather Carved Rose Snap Cuff Bracelet with Scalloped Edges Wide cuff, 1 1/2" wide, carved r..
Genuine Cowhide Snap Cuff Bracelet with Whip Edge Wide cowhide cuff with whipstitch, 1 1/2" wide,..
Leather Snap Cuff Bracelet Slightly Distressed Skinny colorful leather cuff, 1/2" wide, snap..
Leather Snap Cuff Bracelet with Whip Edge Skinny colorful leather cuff with contrasting whip..